Better volumes and pricing have helped the Russian gas giant outperform the main Moscow index since the summer. Investors should be cautious. Swollen capex and a fresh row with Ukraine are reminders that Gazprom works more like an arm of the Kremlin than a normal listed company. 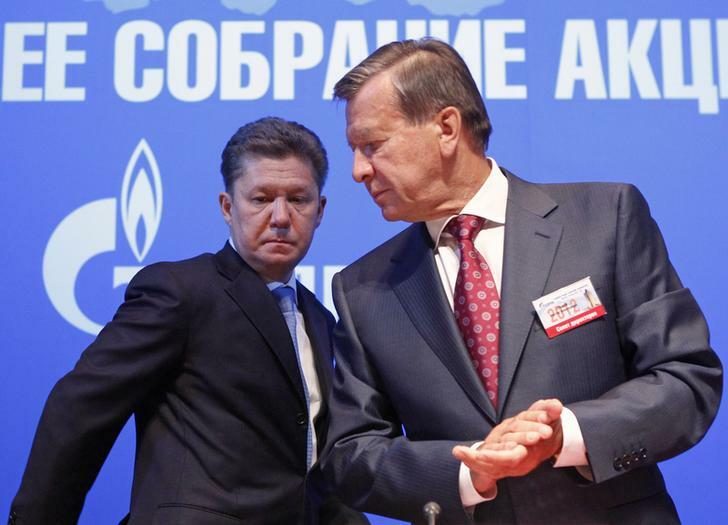 Head of Russian gas giant Gazprom Alexei Miller (L) and Gazprom's Board Chairman Viktor Zubkov take part in the company's Annual General Meeting of shareholders in Moscow June 29, 2012. Gazprom’s board of directors approved increasing the gas giant’s 2013 capital spending budget to $32 billion on Oct. 29, up from an earlier target of $22 billion, the Interfax news agency reported. Last year, Gazprom’s chief financial officer said the company would cut capital spending by 10 percent during the period. Separately, Gazprom said it was concerned about Russian neighbour Ukraine’s ability to pay for gas after it failed to pay for some deliveries. On Oct. 31, Ukrainian Energy and Coal Industry Minister Eduard Stavitsky said that the issue of paying the debt to Gazprom was supposed to be resolved by Naftogaz Ukraine by the end of the working day. “I gave the chairman of Naftogaz Ukraine’s management board two days to resolve this issue. I’m confident that he’ll get the job done. The time to resolve the issue runs out today after lunch.” The minister said he had not yet managed to review the statements by the Russian side about possibly requiring Ukraine to pay in advance for gas.